High-content analysis (HCA) describes the use of automated fluorescence microscopy and a wide array of fluorescent probes for the study of fixed or live cells, tissues, or even whole organisms, where quantitative phenotypic data is obtained from images. The cellular images provide rich multiparametric information concerning biological processes and their modulation by diseases, hence the use of the term high content. When HCA applications call for screening chemical libraries in an effort to find compounds that induce or inhibit a desired phenotypic change, the process is typically more automated and uses microplates and automated liquid-handling devices to increase sample throughput, allowing libraries to be screened in a reasonable time frame. While this additional level of automation is comparable to that used in high-throughput screening (HTS), the need to capture and process images for the multivariate data ensures that a greater time is required to execute a screening campaign. Typically HCA imagers require almost 10 minutes to process one 96-well microplate for one fluorophore generating a phenotypic response. Compared to HTS microplate readers that quantify light emission from the whole microplate well using PMT-based detection, these read times are at least 10x slower. This problem is compounded for each additional fluorophore quantified. This attribute has typically limited the use of HCA to secondary screening of hits from a primary HTS screen, target discovery (i.e., RNAi screening) or lead optimization (i.e., toxicity) applications where the compound number screened is relatively small. In addition, the data-storage requirements are arduous as the screening of a full 96-well plate for a single fluorophore will require about 200 MB storage space. The hard drives of typical computers used to drive these imagers are not compatible for HCS data storage, and dedicated external data storage devices in the 1–10 terabyte range are required. Lastly, HCS instruments are typically cost prohibitive for many laboratories, especially for academic labs relying on government funding agencies. HCS instruments are typically reserved for industry or core facilities in universities. BioTek Instruments’ new Cytation™3 Cell Imaging Multi-Mode Reader aims to remedy some of these issues in addition to providing a highly flexible microplate reader. The Cytation3 is built from BioTek’s Hybrid Technology™ consisting of dual optical paths, each using PMT-based detection, but using separate methods for wavelength selection. One optical path uses quadruple grating monochromator-based light dispersion for spectral scanning applications and wavelength selection flexibility; the other, filter cubes consisting of a dichroic mirror and both excitation and emission spectral filters providing rapid analysis and high sensitivity. 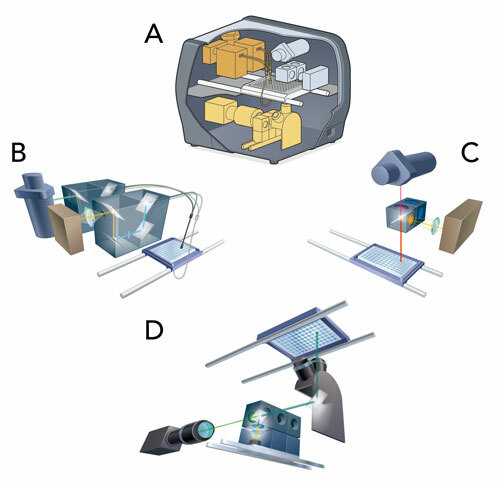 In addition to this established architecture, the Cytation3 incorporates a microscopy module that provides automated digital widefield fluorescence and brightfield microscopy (Figure 1). This microscopy module uses high-quality optical components including a 16-bit scientific grade CCD camera, LED, and spectral filter cubes that allow high sensitivity analysis using a wide selection of fluorescent probes including the family of fluorescent proteins. Figure 1. Cytation3 optical modules: (A) Orientation of the three optical modules; (B) PMT-based detection using monochromators and optical fibers for both top and bottom reading; (C) PMT-based detection using filter cubes; (D) CCD-based widefield fluorescence microscopy. Magnification is provided from 2x for full-well imaging to 20x for submicron resolution of subcellular details. Consistent with its abilities as a microplate reader, Cytation3 provides affordable microscopy automation including automated XY stage positioning, autofocus, autoexposure, and automated image capture. Cytation3’s Gen5™ Data Analysis Software drives the instrument, collects data, and performs analysis for all three optical paths, including both manual and automated image capture and analysis for the microscopy module. Furthermore, these data acquisition channels can be used together to enable unique functionality and solve some of the issues previously described in HCA. For phenotypic assays involving a fluorescence intensity change, the PMT-based optics can be used to rapidly scan plates. Gen5 software can be programmed to determine whether individual wells scanned meet a criterion for intensity change and if so, those wells are flagged for imaging. Thus only “hits” in an HCA screen need to be imaged. This saves considerable time and data storage space for a screening campaign. If one considers that the typical hit rate is in the order of 1% for HCA screening, a screening campaign can be accelerated using PMT-based “hit picking” by close to an order of magnitude while requiring only about 1% of the data storage space. We have recently demonstrated this capability with a phenotypic screen of a small library of REDOX compounds (Screen-Well™ REDOX library, Enzo Life Sciences) for the inhibition of chemically induced hypoxia and oxidative stress in keratinocytes. The phenotypic assay was developed using two fluorescent probes: a red fluorophore linked to nitroreductase activity present in hypoxic cells and a green fluorophore activated by reactive oxygen species production (Hypoxia/Oxidative Stress Detection Kit, Enzo Life Sciences). The dual phenotypes were chemically induced using a CoCl2 concentration of 500 μM that induced significant hypoxia and oxidative stress: Using PMT-based detection, each fluorophore demonstrated a change in fluorescence intensity greater than 10,000 fluorescence units in the presence and absence of the CoCl2 dose; from imaging analysis, 75% of cells in the image field of view demonstrated hypoxia and 25% oxidative stress (Figure 2). Figure 2. 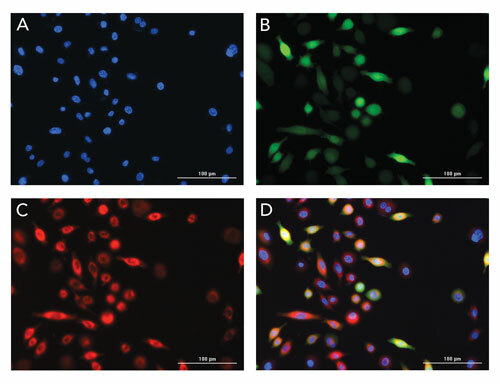 20x images of hypoxic keratinocytes (500 µM CoCl2) stained with: (A) DAPI (blue) to identify cell nuclei; (B) oxidative stress fluorophore (green); (C) hypoxia fluorophore (red); (D) composite image using all three colors. 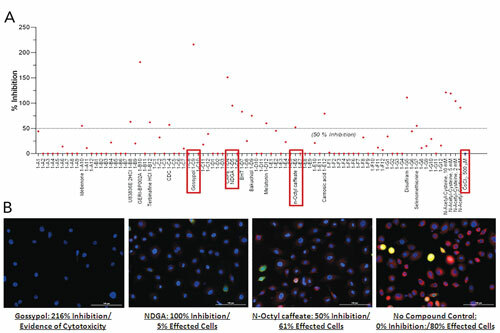 Determination of the percent of cells affected by phenotype is made by the ratio of cells counted in green (oxidative stress) or red (hypoxia) channel to total cells counted using blue (DAPI) channel. These data demonstrate Cytation3’s ability to illustrate phenotype changes based on cell population and subpopulation statistics: The PMT-based detection provides fluorescence intensity changes from an average of the cell population in the microplate well, whereas imaging analysis allows the determination of the relative number of cells in the field of view affected by the phenotype change based on obtaining an intensity increase above an established threshold. The phenotypic screen was set up to use the Cytation3 monochromators and PMT-based detection to screen the REDOX library rapidly for the hypoxia phenotype and follow-up imaging with the hit picking feature of Gen5 for those wells that demonstrated ≥ 50% inhibition of hypoxia induced by the CoCl2. Figure 3 demonstrates the level of inhibition of the REDOX library as determined by the monochromators in addition to the follow-up imaging of a select group of REDOX compounds that demonstrated ≥50% inhibition of hypoxia and a vehicle control. The image analysis confirms the inhibition of hypoxia through the determination of the % cells in the field of view affected by hypoxia. Furthermore, the images help to explain the high inhibition (> 200%) of Gossypol as a cytotoxic effect due to the significant reduction of the number of cells in the field of view. In conclusion, the Cytation3 is a versatile microplate reader that performs PMT-based detection for the quantification of cell-based assays in addition to automated digital widefield fluorescence microscopy for high-content analysis. The utility of the instrument is best defined, however, by its ability to hit pick wells for imaging for HCA applications to reduce screening times and required data storage space. Figure 3. (A) Screen-Well REDOX library screen percent inhibition results calculated from PMT-based whole-well microplate reads. (B) 20x images from select wells exhibiting = 50% inhibition, and no compound control, using Hit Picking feature in Gen5. Peter R. Banks, Ph.D. (BanksP@BioTek.com), is scientific director at BioTek Instruments.